This article is about Suspension bridges with the deck suspended below the main cables. For others, see Suspension bridge types. A suspension bridge is a type of bridge in which the deck (the load-bearing portion) is hung below suspension cables on vertical suspenders. The first modern examples of this type of bridge were built in the early 1800s. Simple suspension bridges, which lack vertical suspenders, have a long history in many mountainous parts of the world. For bridges where the deck follows the suspenders, see simple suspension bridge. The earliest suspension bridges were ropes slung across a chasm, with a deck possibly at the same level or hung below the ropes such that the rope had a catenary shape. The Tibetan saint and bridge-builder Thangtong Gyalpo originated the use of iron chains in his version of simple suspension bridges. In 1433, Gyalpo built eight bridges in eastern Bhutan. The last surviving chain-linked bridge of Gyalpo's was the Thangtong Gyalpo Bridge in Duksum en route to Trashi Yangtse, which was finally washed away in 2004. Gyalpo's iron chain bridges did not include a suspended deck bridge which is the standard on all modern suspension bridges today. Instead, both the railing and the walking layer of Gyalpo's bridges used wires. The stress points that carried the screed were reinforced by the iron chains. Before the use of iron chains it is thought that Gyalpo used ropes from twisted willows or yak skins. He may have also used tightly bound cloth. The first iron chain suspension bridge in the Western world was the Jacob's Creek Bridge (1801) in Westmoreland County, Pennsylvania, designed by inventor James Finley. Finley's bridge was the first to incorporate all of the necessary components of a modern suspension bridge, including a suspended deck which hung by trusses. Finley patented his design in 1808, and published it in the Philadelphia journal, The Port Folio, in 1810. Early British chain bridges included the Dryburgh Abbey Bridge (1817) and 137 m Union Bridge (1820), with spans rapidly increasing to 176 m with the Menai Bridge (1826), "the first important modern suspension bridge". The first chain bridge on the German speaking territories was the Chain Bridge in Nuremberg. The Clifton Suspension Bridge (designed in 1831, completed in 1864 with a 214 m central span) is one of the longest of the parabolic arc chain type. The current Marlow suspension bridge was designed by William Tierney Clark and was built between 1829 and 1832, replacing a wooden bridge further downstream which collapsed in 1828. It is the only suspension bridge across the non-tidal Thames. The Széchenyi Chain Bridge, spanning the River Danube in Budapest, was also designed by William Clark and it is a larger scale version of Marlow bridge. An interesting variation is Thornewill and Warham's Ferry Bridge in Burton-on-Trent, Staffordshire (1889), where the chains are not attached to abutments as is usual, but instead are attached to the main girders, which are thus in compression. Here, the chains are made from flat wrought iron plates, eight inches (203 mm) wide by an inch and a half (38 mm) thick, rivetted together. The first wire-cable suspension bridge was the Spider Bridge at Falls of Schuylkill (1816), a modest and temporary footbridge built following the collapse of James Finley's nearby Chain Bridge at Falls of Schuylkill (1808). The footbridge's span was 124 m, although its deck was only 0.45 m wide. Development of wire-cable suspension bridges dates to the temporary simple suspension bridge at Annonay built by Marc Seguin and his brothers in 1822. It spanned only 18 m. The first permanent wire cable suspension bridge was Guillaume Henri Dufour's Saint Antoine Bridge in Geneva of 1823, with two 40 m spans. The first with cables assembled in mid-air in the modern method was Joseph Chaley's Grand Pont Suspendu in Fribourg, in 1834. In the United States, the first major wire-cable suspension bridge was the Wire Bridge at Fairmount in Philadelphia, Pennsylvania. Designed by Charles Ellet, Jr. and completed in 1842, it had a span of 109 m. Ellet's Niagara Falls Suspension Bridge (1847–48) was abandoned before completion. It was used as scaffolding for John A. Roebling's double decker railroad and carriage bridge (1855). The Otto Beit Bridge (1938–39) was the first modern suspension bridge outside the United States built with parallel wire cables. Drawing of the Tibetan-built Chaksam bridge south of Lhasa, constructed in 1430, with long chains suspended between towers, and vertical suspender ropes carrying the weight of a planked footway below. "View of the Chain Bridge invented by James Finley Esq." (1810) by William Strickland. Finley's Chain Bridge at Falls of Schuylkill (1808) had two spans, 100 feet and 200 feet. Wire Bridge at Fairmount (1842, replaced 1874). The main forces in a suspension bridge of any type are tension in the cables and compression in the pillars. Since almost all the force on the pillars is vertically downwards and they are also stabilized by the main cables, the pillars can be made quite slender, as on the Severn Bridge, on the Wales-England border. In a suspended deck bridge, cables suspended via towers hold up the road deck. The weight is transferred by the cables to the towers, which in turn transfer the weight to the ground. Comparison of a catenary (black dotted curve) and a parabola (red solid curve) with the same span and sag. The catenary represents the profile of a simple suspension bridge, or the cable of a suspended-deck suspension bridge on which its deck and hangers have negligible mass compared to its cable. The parabola represents the profile of the cable of a suspended-deck suspension bridge on which its cable and hangers have negligible mass compared to its deck. The profile of the cable of a real suspension bridge with the same span and sag lies between the two curves. Assuming a negligible weight as compared to the weight of the deck and vehicles being supported, the main cables of a suspension bridge will form a parabola (very similar to a catenary, the form the unloaded cables take before the deck is added). One can see the shape from the constant increase of the gradient of the cable with linear (deck) distance, this increase in gradient at each connection with the deck providing a net upward support force. Combined with the relatively simple constraints placed upon the actual deck, this makes the suspension bridge much simpler to design and analyze than a cable-stayed bridge, where the deck is in compression. Bridge decks can have deck sections replaced in order to widen traffic lanes for larger vehicles or add additions width for separated cycling/pedestrian paths. In an underspanned suspension bridge, the main cables hang entirely below the bridge deck, but are still anchored into the ground in a similar way to the conventional type. Very few bridges of this nature have been built, as the deck is inherently less stable than when suspended below the cables. Examples include the Pont des Bergues of 1834 designed by Guillaume Henri Dufour; James Smith's Micklewood Bridge; and a proposal by Robert Stevenson for a bridge over the River Almond near Edinburgh. Roebling's Delaware Aqueduct (begun 1847) consists of three sections supported by cables. The timber structure essentially hides the cables; and from a quick view, it is not immediately apparent that it is even a suspension bridge. The main suspension cables in older bridges were often made from chain or linked bars, but modern bridge cables are made from multiple strands of wire. This not only adds strength but improves reliability (often called redundancy in engineering terms) because the failure of a few flawed strands in the hundreds used pose very little threat of failure, whereas a single bad link or eyebar can cause failure of an entire bridge. (The failure of a single eyebar was found to be the cause of the collapse of the Silver Bridge over the Ohio River.) Another reason is that as spans increased, engineers were unable to lift larger chains into position, whereas wire strand cables can be formulated one by one in mid-air from a temporary walkway. Most suspension bridges have open truss structures to support the roadbed, particularly owing to the unfavorable effects of using plate girders, discovered from the Tacoma Narrows Bridge (1940) bridge collapse. In the 1960s, developments in bridge aerodynamics allowed the re-introduction of plate structures as shallow box girders, first seen on the Severn bridge built 1961-6. In the picture of the Yichang Bridge, note the very sharp entry edge and sloping undergirders in the suspension bridge shown. This enables this type of construction to be used without the danger of vortex shedding and consequent aeroelastic effects, such as those that destroyed the original Tacoma Narrows bridge. Three kinds of forces operate on any bridge: the dead load, the live load, and the dynamic load. Dead load refers to the weight of the bridge itself. Like any other structure, a bridge has a tendency to collapse simply because of the gravitational forces acting on the materials of which the bridge is made. Live load refers to traffic that moves across the bridge as well as normal environmental factors such as changes in temperature, precipitation, and winds. Dynamic load refers to environmental factors that go beyond normal weather conditions, factors such as sudden gusts of wind and earthquakes. All three factors must be taken into consideration when building a bridge. The principles of suspension used on the large scale may also appear in contexts less dramatic than road or rail bridges. Light cable suspension may prove less expensive and seem more elegant for a cycle or footbridge than strong girder supports. An example of this is the Nescio Bridge in the Netherlands. Where such a bridge spans a gap between two buildings, there is no need to construct special towers, as the buildings can anchor the cables. Cable suspension may also be augmented by the inherent stiffness of a structure that has much in common with a tubular bridge. The Little Belt suspension bridge in Denmark was opened in 1970. Manhattan Bridge in New York City with deck under construction from the towers outward. Suspender cables and suspender cable band on the Golden Gate Bridge in San Francisco. Main cable diameter is 36 inches (910 mm), and suspender cable diameter is 3.5 inches (89 mm). Typical suspension bridges are constructed using a sequence generally described as follows. Depending on length and size, construction may take anywhere between a year and a half (construction on the original Tacoma Narrows Bridge took only 19 months) up to as long as a decade (the Akashi-Kaikyō Bridge's construction began in May 1986 and was opened in May 1998 – a total of twelve years). Where the towers are founded on underwater piers, caissons are sunk and any soft bottom is excavated for a foundation. If the bedrock is too deep to be exposed by excavation or the sinking of a caisson, pilings are driven to the bedrock or into overlying hard soil, or a large concrete pad to distribute the weight over less resistant soil may be constructed, first preparing the surface with a bed of compacted gravel. (Such a pad footing can also accommodate the movements of an active fault, and this has been implemented on the foundations of the cable-stayed Rio-Antirio bridge.) The piers are then extended above water level, where they are capped with pedestal bases for the towers. Where the towers are founded on dry land, deep foundation excavation or pilings are used. From the tower foundation, towers of single or multiple columns are erected using high-strength reinforced concrete, stonework, or steel. Concrete is used most frequently in modern suspension bridge construction due to the high cost of steel. Large devices called saddles, which will carry the main suspension cables, are positioned atop the towers. Typically of cast steel, they can also be manufactured using riveted forms, and are equipped with rollers to allow the main cables to shift under construction and normal loads. Anchorages are constructed, usually in tandem with the towers, to resist the tension of the cables and form as the main anchor system for the entire structure. These are usually anchored in good quality rock, but may consist of massive reinforced concrete deadweights within an excavation. The anchorage structure will have multiple protruding open eyebolts enclosed within a secure space. Temporary suspended walkways, called catwalks, are then erected using a set of guide wires hoisted into place via winches positioned atop the towers. These catwalks follow the curve set by bridge designers for the main cables, in a path mathematically described as a catenary arc. Typical catwalks are usually between eight and ten feet wide, and are constructed using wire grate and wood slats. Gantries are placed upon the catwalks, which will support the main cable spinning reels. Then, cables attached to winches are installed, and in turn, the main cable spinning devices are installed. High strength wire (typically 4 or 6 gauge galvanized steel wire), is pulled in a loop by pulleys on the traveler, with one end affixed at an anchorage. When the traveler reaches the opposite anchorage the loop is placed over an open anchor eyebar. Along the catwalk, workers also pull the cable wires to their desired tension. This continues until a bundle, called a "cable strand" is completed, and temporarily bundled using stainless steel wire. This process is repeated until the final cable strand is completed. Workers then remove the individual wraps on the cable strands (during the spinning process, the shape of the main cable closely resembles a hexagon), and then the entire cable is then compressed by a traveling hydraulic press into a closely packed cylinder and tightly wrapped with additional wire to form the final circular cross section. The wire used in suspension bridge construction is a galvanized steel wire that has been coated with corrosion inhibitors. At specific points along the main cable (each being the exact distance horizontally in relation to the next) devices called "cable bands" are installed to carry steel wire ropes called Suspender cables. Each suspender cable is engineered and cut to precise lengths, and are looped over the cable bands. In some bridges, where the towers are close to or on the shore, the suspender cables may be applied only to the central span. Early suspender cables were fitted with zinc jewels and a set of steel washers, which formed the support for the deck. Modern suspender cables carry a shackle-type fitting. Special lifting hoists attached to the suspenders or from the main cables are used to lift prefabricated sections of bridge deck to the proper level, provided that the local conditions allow the sections to be carried below the bridge by barge or other means. Otherwise, a traveling cantilever derrick may be used to extend the deck one section at a time starting from the towers and working outward. If the addition of the deck structure extends from the towers the finished portions of the deck will pitch upward rather sharply, as there is no downward force in the center of the span. Upon completion of the deck the added load will pull the main cables into an arc mathematically described as a parabola, while the arc of the deck will be as the designer intended – usually a gentle upward arc for added clearance if over a shipping channel, or flat in other cases such as a span over a canyon. Arched suspension spans also give the structure more rigidity and strength. With completion of the primary structure various details such as lighting, handrails, finish painting and paving are installed or completed. Union Bridge (England/Scotland, 1820), the longest span (137 m) from 1820 to 1826. The oldest in the world still in use today. Roebling's Delaware Aqueduct (USA, 1847), the oldest wire suspension bridge still in service in United States. John A. Roebling Suspension Bridge (USA, 1866), then the longest wire suspension bridge in the world at 1,057 feet (322 m) main span. Brooklyn Bridge (USA, 1883), the first steel-wire suspension bridge. Bear Mountain Bridge (USA, 1924), the longest suspension span (497 m) from 1924 to 1926. 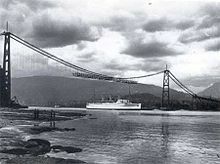 The first suspension bridge to have a concrete deck. The construction methods pioneered in building it would make possible several much larger projects to follow. Ben Franklin Bridge (Philadelphia, PA, USA, 1926), replaced Bear Mountain Bridge as longest span at 1,750 feet between the towers. Includes an active subway line and never-used trolley stations on the span. San Francisco–Oakland Bay Bridge (USA, 1936). This was once the longest steel high-level bridge in the world (704 m). The eastern portion (a cantilever bridge) has been replaced with a self-anchored suspension bridge which is the longest of its type in the world. It is also the world's widest bridge. Golden Gate Bridge (USA, 1937), the longest suspension bridge from 1937 to 1964. It was also the world's tallest bridge from 1937 to 1993. Mackinac Bridge (USA, 1957), the longest suspension bridge between anchorages in the Western hemisphere. Si Du River Bridge (China, 2009), the highest bridge in the world, with its deck around 500 metres above the surface of the river. Silver Bridge, Point Pleasant, West Virginia – Eyebar chain highway bridge, built in 1928, that collapsed in late 1967, killing forty-six people. Tacoma Narrows Bridge, (USA), 853 m – 1940. The Tacoma Narrows bridge was vulnerable to structural vibration in sustained and moderately strong winds due to its plate-girder deck structure. Wind caused a phenomenon called aeroelastic fluttering that led to its collapse only months after completion. The collapse was captured on film. No human lives were lost in the collapse; several drivers escaped their cars on foot and reached the anchorages before the span dropped. Category:Suspension bridges — for articles about specific suspension bridges. Timeline of three longest spans whether bridge, aerial tramway, powerline, ceiling or dome etc. Cable-stayed bridge — superficially similar to a suspension bridge, but cables from the towers directly support the roadway, rather than the road being suspended indirectly by additional cables from the main cables connecting two towers. Inca rope bridge — has features in common with a suspension bridge and predates them by at least three hundred years. However, in a rope bridge the deck itself is suspended from the anchored piers and the guardrails are non-structural. Self-anchored suspension bridge — combining elements of a suspension bridge and a cable-stayed bridge. Simple suspension bridge — a modern implementation of the rope bridge using steel cables, although either the upper guardrail or lower footboard cables may be the main structural cables. 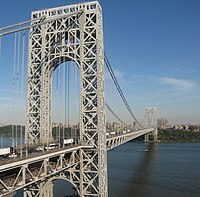 ^ "Port Authority of New York and New Jersey - George Washington Bridge". The Port Authority of New York and New Jersey. Archived from the original on 20 September 2013. Retrieved 13 September 2013. ^ Bod Woodruff; Lana Zak & Stephanie Wash (20 November 2012). "GW Bridge Painters: Dangerous Job on Top of the World's Busiest Bridge". ABC News. Archived from the original on 28 September 2013. Retrieved 13 September 2013. ^ Bhutan. Lonely Planet. 2007. ISBN 978-1-74059-529-2. ^ "Chakzampa Thangtong Gyalpo" (PDF). Centre for Bhutan Studies. p. 61. Archived (PDF) from the original on 25 May 2014. ^ "Iron Wire of the Wheeling Suspension Bridge". Smithsonian Museum Conservation Institute. Archived from the original on 30 April 2011. ^ Bridges: Three Thousand Years of Defying Nature. MBI Publishing Company. 12 November 2001. ISBN 978-0-7603-1234-6. ^ "Menai Bridge - bridge, Wales, United Kingdom". britannica.com. Archived from the original on 13 April 2015. Retrieved 3 May 2018. ^ a b c d Peters, Tom F. (1987). Transitions in Engineering: Guillaume Henri Dufour and the Early 19th Century Cable Suspension Bridges. Birkhauser. ISBN 3-7643-1929-1. Archived from the original on 10 July 2014. ^ Cleveland Bridge Company (UK) Archived 20 July 2008 at the Wayback Machine Web site Retrieved 21 February 2007, includes image of the bridge. ^ a b Drewry, Charles Stewart (1832). A Memoir of Suspension Bridges: Comprising The History Of Their Origin And Progress. London: Longman, Rees, Orme, Brown, Green & Longman. Archived from the original on 16 June 2013. Retrieved 13 June 2009. ^ "DRPA :: Delaware River Port Authority". drpa.org. Archived from the original on 4 March 2009. Retrieved 3 May 2018. ^ McGloin, Bernard. "Symphonies in Steel: Bay Bridge and the Golden Gate". Virtual Museum of the City of San Francisco. Archived from the original on 1 November 2010. Retrieved 12 January 2008. Look up suspension bridge in Wiktionary, the free dictionary. Historic American Engineering Record (HAER) No. NJ-132, "Contextual Essay on Wire Bridges"